Welcome to Day #7 of Chocolate and Central America Theme Week. Today we make a quick stop in Nicaragua before heading down to Costa Rica. 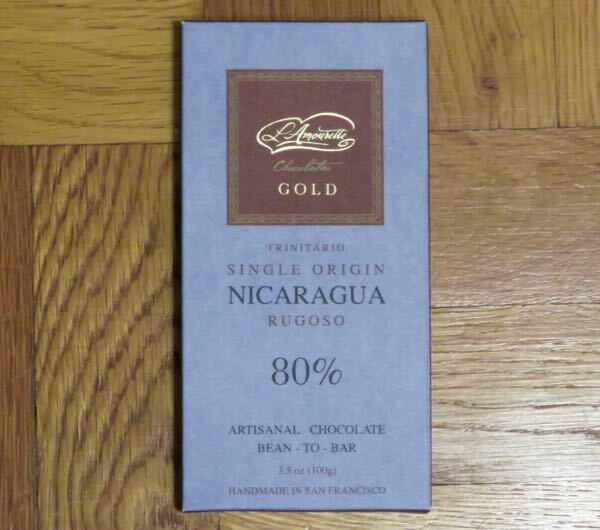 We've covered some of our favorite Nicaraguan chocolates in previous years (such as Momotombo Chocolate bars and confections crafted by Carlos Mann and team in Managua); but this week, this 80% Nicaragua Rugoso bar from L'Amourette Chocolatier (San Francisco, CA) will be our only stop. Chief chocolatier at L'Amourette, Andre V, says he fell in love with Rugoso cacao, the famous, flavorful Trinitario beans used to make today's Nicaragua 80% dark bar. Today's bar was one of "Gold" series from L'Amourette focused on higher-end single origin bars. Three types of cacao beans are often discussed: Criollo, Trinitario and Forastero. Almost all bulk chocolate is made with Forastero cacao beans. Criollo and Trinitario (a Criollo-Forastero hybrid originally made with Criollo beans from Venezuela) are known for their fine flavor. Venezuelan Criollo and Trinitario beans are legendary—known for their complex, subtle, layered flavors. Some of these fine flavor cacao beans made their way to Nicaragua and other Latin American countries where they've been cultivated. Such was the case with today's bar. As advertised, these sweet and delicate beans yielded delicate flavors (twinkles of sweetness, fruit, light earth). 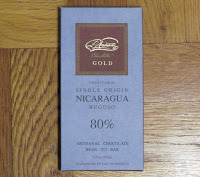 Very light, particularly for an 80% cacao bar.